Investigation into the ways in which the law has been used by the Israeli state to ideologically legitimise land expropriations and the erosion of civil liberties for Palestinians. For footnotes and selected bibliography, please see the issue PDF. - Libcom ed. SINCE THE BEGINNING of its occupation of the West Bank and Gaza Strip, Israel has pursued an uninterrupted policy of Jewish settlement in those territories. Early calls for an exchange of land for peace quickly faded to the background, and successive Israeli governments have differed only in their strategies where settlement is concerned. Thus, in the first twenty years of occupation, over 125 Jewish settlements have been established by both Labour and Likud, home to over 50,000 Jewish settlers. The establishment of settlements in territories inhabited by over a million native Palestinians has required widespread land expropriation and the suppression of Palestinian social and economic development, accompanied by repression of Palestinian resistance to Jewish settlement. For a minority of Israeli Jews, Jewish settlement in the West Bank and Gaza Strip (like that which took place in Israel's 1948 borders) is regarded as a religious imperative-the fulfillment of a biblical promise and thus the indigenous Palestinian inhabitants are merely temporary custodians with no enduring rights to property or life there. For this radical minority, land expropriation is simply the return of the territory to its rightful owner, and suppression and repression are the necessary means to purge the land of gentiles (or to rebuild the upright and proud Jewish soul). But how are Israeli policies explained and justified by the majority of religious and secular Jews who have little truck with such outspoken Jewish religious fundamentalism? Why are the vast majority of Israeli Jews prepared to serve in the army of occupation and actively concerned to defend Israeli policies in the face of widespread international condemnation? Naturally there are dissenters: conscientious objectors, peace protestors and so on; but still the fact remains that Israeli settlement and repression continues with the support and consent, albeit contradictory and ambivalent, of the majority of the Israeli Jewish population. As the Palestinian uprising prepares to celebrate its first anniversary, and international calls for a peace settlement are more numerous than ever, the Israeli bulldozers roll on: demolishing Palestinian homes and building new villas for Jewish immigrants. At the economic level there is a simple answer to this question. The occupation generates a large workforce of cheap Palestinian labour and constitutes a private and highly lucrative market for Israeli consumer goods. Racism is always founded on economic exploitation, and this relationship is especially marked in a settler-colonial context. With the huge US subsidy to pay for the machinery of repression in the territories, Israeli Jews benefit economically from the exploitation of Palestinian labour and the Palestinian market. Colonialism distorts the basic capitalist class contradictions in favour of national oppression and brings the economic interests of the colonial working class more into line with its own bourgeoisie: thus Israeli Jews actually have a material interest in continuing the process of settlement. In this paper I will examine some of the legal and ideological mechanisms which are active in distorting the class contradictions in Palestine and which continue to win the support of the majority of Israeli Jews for Israeli colonialism. I will look at the legal and judicial apparatus which facilitates and legitimises land expropriation, Jewish settlement, suppression of the Palestinian economy, and repression of Palestinian resistance, and I will attempt to fùl in the ideological framework within which Israeli writers, politicians, legislators, judges and soldiers operate when explaining and justifying their actions. Although my study is intentionally restricted to Israel and the occupied territories (and in particular the West Bank), many of the issues covered sound a distinct echo in the political culture of Western countries. The ideological mechanisms which are active in winning support amongst Israeli Jews for Zionist expansionism are reflected in those which operate in Britain and elsewhere in gaining the support of Jews and non-Jews for Israel. It is with this in mind that I hope that this paper will contribute something to the project of demystifying Zionism in the West and winning support for the Palestinian national liberation struggle. 1. The permanent transfer of population (identified as 'Jewish') to the West Bank, whether present Israeli citizens or new immigrants. 2. The establishment of a supporting infrastructure able to sustain the settler communities (roads, basic services, communications, etc.). 1. The extension of Israeli citizenship to and the political enfranchisement of the settlers, but not the indigenous population. 2. The administration of the settler communities separately from the indigenous population. 3. The support and development of the settler economy. 1. The active accommodation of the Palestinian infrastructure, administration and economy to their Israeli settler counterparts. 2. The accommodation of the Palestinian population to Israeli settlement, including the suppression of resistance. The use of the law in securing these objectives has both a coercive and a consensual aspect. In fact the two are mutually dependent, since repression achieved through legal and judicial practices relies on the representation and objectification of these practices for its legitimation. Thus, at the same time as the legislatory and juridical apparatus is used to put settler-colonial objectives into practice, it also plays a central role in justifying the objectives themselves. These legal justifications, when superimposed upon and inserted within discourses around the interests of various collectivities ('the public', 'the Jews', etc. ), provide Israelis (and to a much lesser extent Palestinians) with a means of 'making sense' of Israeli settlement in the West Bank. I will now look at two strategic and ideologically significant legal practices in some detail, namely the acquisition of land and the extension of Israeli law to settlers. At the outset, it was essential to seize control of government and law. Thus, in the proclamation on law and administration (No.2) of 7 June 1967, the commander of the Israel Defence Forces (IDF) on the West Bank assumed 'any power of government, legislation, appointive, or administrative'. In addition the following principle was agreed by the Israeli government on 11 October 1968: 'The Area Commander is the exclusive formal authority within the area. He [sic] is the legislator, he is the head of the executive and he appoints local officials and local judges'. With total control concentrated in the hands of one individual, the ground was cleared for putting the settlement objectives into practice. ONE OF THE FIRST PROBLEMS to be confronted was that of acquiring land on which to build the settlements. Three bodies of secular law have been drawn upon in a highly eclectic manner by the Israeli authorities in order to acquire land in the West Bank. The oldest of these dates back to Ottoman times. Where no appropriate legislation could be found, the Area Commander has simply used his [sic] own authority to issue a military order. All the methods employed have tended either to define the land in question as the property of the state or to render Palestinian claims to the land illicit or inapplicable. Expropriation of ownership: By virtue of the above proclamation on government of the territories, all land which was previously registered in the name of the Jordanian government immediately became the property of the Israeli state. In addition, through a combination of two Israeli laws passed in 1950, plus a military order specially designed for the purpose, all property owned by persons who left the area in, or before, 19679 was considered 'abandoned', and was transferred to the 'Custodian of Abandoned Property'. The burden of proof of ownership of 'abandoned' land rests with the individual claiming rights. The most successful method of land expropriation was adopted in 1980, whereby all uncultivated, unregistered land is considered liable for declaration as state land by virtue of an Israeli interpretation of the Ottoman Land Code (1855). Declarations of state land are not made through judicial process of land registration, but rather preempt it. The only judicial redress open to inhabitants is appeal to a review committee, composed of military government officials. The final method of expropriation of ownership is based on a Jordanian law, which allows for 'Land Expropriation for Public Use', as long as this is in the 'public interest'. This method is thus used to acquire land for arterial and access roads which bypass Arab towns and villages, as well as public buildings in the Israeli settlements. These acquisitions are justified as being in the interest of a rapidly expanding Jewish public. Seizure of possession: This is effected in individual cases by military order. The Area Commander is free to declare an area of land 'closed' for reasons of 'military security' or to seize possession of land for 'military purposes'. Restrictions on use: These are also contained in military orders. Restrictions range from prohibitions on building and construction to restrictions on cultivation without express permission. In addition, certain areas of land have been declared 'nature reserves' or 'combat zones' , in the latter case the authorities disclaiming any responsibility for damage incurred by military action. Often a number of these methods will be tried in turn, beginning with offers to buy land. If the owner will not sell, then the area in question may simply be declared state land, or requisitioned for military purposes. In the first case, the burden of proof of ownership rests with the present occupier, whose Ottoman deeds will normally be declared invalid. In the latter, there is no appeal. ALL THESE METHODS of land expropriation are themselves legitimised by being within the law. This legitimation relies on a representation of the law as the protector of the interests of the collectivity against the individual who seeks private gain, and thus as the protector of the rights of the 'law-abiding individual'. In addition it relies on traditional perceptions of the law as the force of rationality, somehow 'objective' or 'scientific'. Thus the law operates as a powerful force in the ideological field, defining what is in the public interest and what is in the interest of national security, and therefore who is outside the national collectivity and the national interest. And indeed, national security and the public interest are often mobilised to justify the laws which define them. For instance, it is often said that West Bank settlements are important in maintaining the security of the Israeli state. This assertion has the powerful ability to conjure up images of 'war', 'invasion' and 'terrorism' in the minds of the receptive Israeli audience, appealing to the very real fear of many Israelis of the 'Arab Threat'. Whether or not the settlements are actually likely to reduce the risk of such occurrences is not important in this context. What counts is the connection which has been made and its strong potential to mobilise support for continued settlement, by drawing upon the everyday image-stock and experience of its audience. The same goes for the notion of serving the 'public interest', which appeals to a deeply experienced sense of the importance of justice within the law. After all, fair's fair; the Palestinians may sometimes get a bad deal, but the law is only doing its best to cater for the needs of everyone in the territories. Individuals always have to make concessions to the public interest, as defined by the law, otherwise society would cease to function. Of course, what is missing in this line of reasoning is the potential of the law to defme the 'public interest' in such a way that it actively excludes the interests of the majority of the population. But this contradicts directly the prevailing representation of the law as the protector of the interests of all its subjects, except those whose deviant actions conflict with the 'collective interest'. THE NOTIONS OF 'national security' and the 'public interest' have an important role to play in mobilising support for the law in all modern nation states. In Israel, however, the law is further supported by a set of ideas which draw on images particular to the experiences and continually represented history and traditions of 'the Jews'. These centre on the idea that the 'Land of Israel' either belongs or is of peculiar importance to 'The Jewish People'. This idea is expressed in a myriad of contradictory forms, both religious and secular, fundamental and utilitarian, as the subject of history, and as its object. The central images which lie beneath these various expressions are those of 'Jewish Tradition', 'Jewish Religion' and 'Jewish Culture' on the one hand, and 'Anti-Semitism' (connected in Israel to the 'Arab Threat') and the danger of 'Assimilation' on the other. The roots and mutual interplay of such ideas in the history of Israeli political culture are extremely complex and I do not intend to unpack them in any detail. What is important here are the perceptions of Israel associated with these ideas and images: Israel solves problems, satisfies aspirations or fulfills requirements of 'The Jewish People'. Thus Israel is a haven from anti-Semitism, a place where 'Jewish Culture' may be preserved and developed freely, a locus of biblical destiny and spiritual redemption, a fulfillment of ancestral tradition or simply a state machine which defends the present Jewish population from the 'Arab Threat'. In all these cases a clear idea emerges: Israel in some sense either belongs or is of peculiar importance to 'The Jewish People'. This I will call the 'special relationship' (SR) notion. The ideas which form the basis of the SR notion are constantly reproduced and represented in schooling and in the media, rooted in and appealing to the very real experiences of their audience. Thus the notion allows people in Israel to give meaning to their own actions. In whatever complex and contradictory way the notion is understood, it will serve as a filter, a conceptual apparatus, through which to 'make sense' of the individual's actions and experiences. Thus the soldier who is called upon to evict a Palestinian forcibly from a piece of land will have the conceptual apparatus at his or her fingertips to explain his or her actions. The judge whose job it is to evaluate a convincing Palestinian land claim which conflicts with a planned Israeli settlement will be able to make some sense of his or her ruling that the land deeds are invalid by virtue of the SR notion. And the 'innocent' Israeli citizen, who reads in the paper that his/her government has just sanctioned another settlement in an area of dense Arab population will be able to find ways to explain it in terms which make sense to him or her. Thus the appeal to the idea that there exists a 'special relationship' will often provide the only way of making sense of the world. And the SR notion is often appealed to directly in dealing with specific land claims. When the 'extremist' settlers 'took the law into their own hands' and established a settlement in the heart of Arab Hebron, there was initially no way to legitimise the action by existing legislation or a new military order. Thus, the settlers made use of several forms of the SR notion. For example, they claimed that 'there have always been Jews in Hebron', and that the present inhabitants were no more than custodians of 'Jewish property'. They also referred to the religious significance of the city to the 'Jewish People'. Thus these different formulations appealed to differing systems of justification embedded in the SR notion. It is precisely the diverse and ambiguous nature of the images underlying the notion which make it a powerful ideological force as a mobiliser of different constituencies of support. And the appeals in this case were successful in averting a legal crisis until the authorities could find a way to justify the settlement by legal means. The 'special relationship' is much more than a last resort in times of crisis. It inhabits the realm of 'common sense', of 'how things are'. It simply makes no sense to suggest that land and property in East Jerusalem were taken from Palestinian Arabs illegally immediately after the occupation began. Jerusalem – East or West – is a part of Israel; that's just the way it is. There is simply no other way of thinking about it, so strong are the images mobilised around the SR notion in this context. A fmal example of the significance of the 'special relationship' in acquiring land in the West Bank is offered by those groups who believe that all of Eretz Israel, including the whole of the West Bank, belongs to 'The Jewish People' by virtue of its centrality in 'Jewish Tradition', and that the Palestinians have no rights of ownership whatsoever. Amana, the settlement division of Gush Emunim, subscribes to this belief, asserting that 'the only justification for Jews to be living in this Palestinian area is because it was the land that was maintained as a part of our tradition for all these years'. And further, 'you cannot apply practical political rules to the way the Jewish state operates'. 'If your philosophy is placed on a sideline and practicality takes its place exclusively, then you may end up with something that's very practical but you'll lose the game.' Thus 'practical political rules' (that is 'regular' state law), although used extensively as a way of securing ownership of land in the West Bank, are not the real justification. This lies elsewhere, in the realm of absolute rights of possession based on 'national tradition'. Amana is now an official settlement organisation of the Israeli state and consequently receives extensive funding from the Israeli authorities. Thus Amana, although represented as a bit 'extreme', is used by the state to put an extra-legal version of SR into practice. In summary; Israeli expropriation of land in the West Bank is achieved by ingenious manipulation of the law, so that land acquisition can be described as falling entirely 'within the law'. This legitimation process relies on the traditional notion that the law is the impartial defender of the collective interest, and of the rights of the individual. In addition, the whole process takes place within a particular ideological climate, in which the idea that there exists a 'Jewish People' with a special or peculiar relationship with 'The Land of Israel', is extremely pervasive. This idea takes on many contradictory forms, which only serve to broaden its appeal, and thus to increase its importance in adding extra legitimation to Israeli settlement. It achieves this by helping to 'make sense' of the experiences and actions of individuals in relation to the acquisition of land for settlement, or through 'fundamentalist' adherents it provides a direct route for extra-judicial settlement. Thus the two important themes here are traditional: one centres around traditional notions of the nature of the law, the other around that of the 'Jewish People'. IT IS CLEAR from the settlement objectives outlined above that a strict legal distinction had to be made between the Israeli settlers in the West Bank and the indigenous population. How else could the two populations be administered separately, and political enfranchisement within the Israeli system be denied exclusively to the latter? Similarly, the idea of planning in the 'public interest' in the context of Israeli settlement relies on a definition (within the law) of 'the public', which explicitly or by omission excludes Palestinians. By 1984, this problem had been all but solved. A way had been found to extend full Israeli citizenship to all West Bank settlers, and to bring them under the jurisdiction of Israeli law and Israeli courts, without extending the same privileges to the Palestinians. The method used was to define the jurisdiction of Israeli law and Israeli courts in terns of who it covers, not its territorial extent. As in the case of land acquisition, this solution makes use of a definition of the community or collectivity of souls referred to as 'The Jews' . The solution was put into practice by making a succession of amendments to a set of Emergency Regulations which were introduced at the start of the occupation.26 Initially these regulations had served to extend the jurisdiction of the Israeli courts to Israeli nationals who committed an offence whilst travelling in the occupied territories. This was necessitated by the relative ease of travel which was now possible across the Green Line. Explicitly excluded from the jurisdiction of the courts were 'residents' of the 'regions', i.e. the occupied territories. This meant that Israeli settlers were excluded along with the Palestinians. Thus, in their initial form, these regulations simply served to extend the territorial extent of Israeli jurisdiction, without incorporating those persons resident in the appended territory. However, in July 1975, an amendment to the Emergency Regulations was introduced which qualified the definition of the group excluded from Israeli jurisdiction. It now read, 'any person who at the time of the act or the omission was a resident of one of the regions and was not registered in the Population Register' (my emphasis). Naturally, Palestinians living in the occupied territories do not qualify for an entry in the Israeli Population Register. Apart from present Israeli nationals or permanent residents of Israel, the only persons who are eligible for registration are' Jews' , and their families, as defined in the Israeli Law of Return. This extension of legal jurisdiction to 'Jews' was consolidated in a final amendment to the regulations in January 1984. This set out a list of Israeli laws which were henceforth to apply to 'any person whose place of residence is in the region [the occupied territories] and who is an Israeli citizen or entitled to acquire Israeli citizenship pursuant to the Law of Return'. This list is extendable by the Israeli Minister of Justice. Thus, strictly speaking, a legal distinction had been made between those permanent residents of the occupied territories who are defined as 'Jewish', and those who are not. The former are now Israeli citizens who fall under the jurisdiction of Israeli law and Israeli courts; the latter are merely 'residents' of the 'areas'. The importance of establishing this distinction cannot be overemphasized. It means that as far as regular Israeli law is concerned, Palestinians in the occupied territories simply do not exist - they are outside the law. Furthermore, they have been defined out of the national community (identified in the Law of Return), which Israeli law claims to serve, since they are 'non-Jews'. They have no claims to Israeli state land, and their interests do not have to be taken into consideration when planning in the 'public interest'. Thus, in the words of Meron Benvenisti, 'All communal lands are the patrimony of the Jewish community, being the only legitimate collective'. 'Closed areas are closed for Palestinians only, and open for Israelis.' Israeli settlements in the West Bank are now served by their own local and regional councils, which have been incorporated into the government administration in Israel proper. Funds for settlement are allocated by the Ministry of Housing and Construction, the budgets being fully integrated with those for construction inside Israel. Local councils are also regularly allocated funds by the Ministry of the Interior and Religious Affairs. Land planning is carried out by the responsible bodies in Israel, in conjunction with the 'High Planning Committee' in the West Bank, which superseded the Palestinian/Jordanian planning authority. The latter had provided for the full participation of members of the local community in land planning. The new 'High Planning Committee' is made up entirely of Israeli government representatives, with negligible local participation. So far its plans seem to be oriented towards developing an infrastructure for the Israeli settlements entirely separately from that which serves the Palestinians, the latter being neglected in the main. Official blueprints refer to the following objectives: 'interconnection between existing Jewish areas in order to create continuity in Jewish settlement patterns; fragmentation of Arab settlement blocs; and encouragement of new Jewish settlement blocs'. Thus, having lifted the Israeli settlers up into the cradle of the law and the nation, whilst leaving the indigenous population down on the ground below, legislative and administrative power could quite 'legitimately' [sic] be used to actively promote the interests of Israeli settlement and to accommodate the 'natives' as required. This accommodation was achieved by military rule. ON ASSUMING GOVERNMENTAL and judicial authority over the West Bank, the Area Commander CAC) proceeded to set up a Military Government CMG), staffed by Israeli army personnel. These Military Government officials were appointed by the Area Commander who delegated to them a wide range of administrative and legal functions. Where existing Jordanian/Palestinian administrative and judicial bodies were not dismantled, they became ultimately accountable to the Area Commander. Thus the Military Government was able to exercise a great deal of control over almost every conceivable aspect of the lives of Palestinian inhabitants of the occupied territories, from land-use, distribution of water, and construction of buildings; through investment and employment; to freedom of movement, organisation, expression, and assembly. Since the very existence of an indigenous population presents an obstacle to increased Israeli settlement, extensive use has been made of these powers to control and restrict the normal functioning and development of Palestinian society and economy. Like the state bodies directly responsible for Israeli settlement planning, the Military Government has considerable leeway to defme what is, and what is not, 'in the public interest'. Thus it is not in the 'public interest', as defined by the MG, to permit the expansion of Palestinian towns and villages into areas which may be designated for future Israeli settlement - building permission is frequently denied. Nor is it in the 'public interest' to allow Palestinians to make extensive use of water, if this is needed by the settlements - permission to sink wells is often refused. And the 'public' is best served by introducing special financial incentives for Israeli businesses moving to the West Bank, whilst imposing strict trade restrictions on Palestinian produce. Palestinians who have grievances against decisions made by the MG can take them to the Military Objections Committee, which itself consists of MG officials. In the last instance, the Israeli High Court of Justice will take petitions and hear appeals on behalf of West Bank Palestinians, as long as they are represented by Israeli lawyers. However, it is not clear whether the High Court actually has the authority to overturn MG rulings, particular if they are presented as masters of 'security'. In explaining his refusal to scrutinize one such appeal, High Court Judge Justice Vitkon declared, 'security matters, like matters of foreign policy, are not justiciable'. Reference to 'security' is the most commonly-used explanation of laws and rulings by the MG which are likely to be contested. The 'security' justification is used in the overwhelming majority of cases where the freedom of Palestinians is restricted by military order or by reference to the Emergency Regulations (1945) enacted by the British Mandate Government; e.g. prohibitions on membership in Palestinian political parties; censorship, including prohibitions on publishing or displaying anything with 'a political significance', such as the Palestinian flag; restrictions on travel into Israel; the requirement that all Palestinians carry an identity card at all times; the temporary closure of universities and trade union offices; the banning of trade union meetings; and cultural events; as well as curfews on whole towns or camps. Specific restrictions are also placed on individuals, for example, 'Town Arrest,' or 'House Arrest,' which confine the individual to her or his place of residence (town or dwelling) for the specified period (normally six months), thus precluding the possibility of continuing employment. Persons under 'Town Arrest' are normally required to report to the nearest military headquarters each day, at their own expense. Palestinians charged under military law are tried in military courts operated by the MG. However, since 'security' offenders are often not given a trial, or even told the reasons for the restrictions imposed upon them, it is not easy to make a clear distinction between punitive and preventative measures. All that is required is that the Area Commander CAC) judge the restriction necessary in the interests of 'security'. The AC may imprison any Palestinian without trial for a period of up to six months, the term of imprisonment being indefinitely renewable. This is known as 'Administrative Detention'. Other sanctions which are frequently used against 'security' suspects are the demolition or 'sealing' of the house of the suspect and his or her family, or deportation. Individual and collective freedoms are also restricted by means of policing practices. The West Bank is policed by a civilian force under the aegis of the MG, backed up by IDF soldiers. It is the latter who deal almost exclusively with matters relating to military orders or restrictions. In addition, IDF soldiers regularly set up road blocks in carefully selected locations, such as on the approach road to a university. Passage may be refused, again usually on the grounds of 'security'. Frequent raids on university campuses and dormitories, as well as private residences, have been reported. And there have been numerous reports of various forms of harassment, intimidation, and torture of Palestinians by the IDF, both on the streets and in custody. In 1981, the Israeli authorities established a Civilian Administration in the West Bank, with certain secondary legislative and administrative responsibilities. However all primary legislative power remained with the Area Commander of the IDF, who was responsible for appointing the head of the Civilian Administration. Thus, although this move served a cosmetic function by appearing to follow the spirit of the Camp David accords, it did not significantly alter the distribution of power. Thus the Israeli state, through the IDF, assumed responsibility for all the administrative and legal affairs of the West Bank Palestinians. By virtue of this highly-centralized concentration of power, it has had considerable space within which to define what constitutes a crime and what does not. These definitions of criminality are, in the main, reliant on the terms 'public interest' , and in particular 'security' . Since the normal functioning and development of Palestinian society is an obstacle to Israeli settlement plans, it is also contrary to the 'public interest' as defined by the Israeli authorities. As a result a very great range of Palestinian activities, from building houses to writing newspaper articles and poetry, is criminalised; it constitutes a resistance which must be confronted and removed by the Military Government. For the vast majority of the Israeli population, the criminalisation of Palestinian resistance is not a conspiracy. On the contrary, these criminal definitions are simply the only way of making sense of what is happening. For the IDF soldier on duty in the West Bank, they are the only way of understanding his or her own actions. On the other hand, these definitions are not simply fed to the masses. Rather, individual Israeli citizens are active in bringing them into existence, developing them, articulating their own experiences through them, and swapping them with each other. The discourses around the 'crime problem', or around 'Palestinian disruption of Israeli settlement', or around 'attacks by the Arabs on those "extremist" settlers in the territories', are not open discussions in which full representation is given to conflicting interpretations. The discourse takes place within the framework of existing ideological systems and is highly structured, largely by the media, and through the media by the state. The result is that the representations of Palestinian criminality emerge as common sense explanations of the personal experiences of people living in Israel. An extremely important set of such experiences are those associated with armed or military Palestinian resistance. Experiences of bombings or knifings, and in particular the way they are presented in the media, form powerful images, which, when conjured up at other moments, serve to strengthen and consolidate the criminalisation of many different forms of Palestinian resistance. The discourses which form the basis of the criminalisation process further draw on numerous ideological fragments which have been left behind by more developed ideologies. I will now look at two such ideologies which are important in understanding the criminalisation of Palestinians in the West Bank. One is associated with the colonised 'native', the other with the 'Goy' (i.e. the non-Jew). The good side of this figure is portrayed in a certain primitive nobility and simple dignity. The bad side is portrayed in terms of cheating and cunning, and, further out, savagery and barbarism. Popular culture is still full today of countless savage and restless "natives", and soundtracks constantly repeat the threatening sound of drumming in the night, the hint of primitive rites and cults. Cannibals, whirling dirvishes, Indian tribesmen, garishly got up, are constantly threatening to overrun the screen. They are likely to appear at any moment out of the darkness to decapitate the beautiful heroine, kidnap the children, burn the encampment or threatening to boil, cook and eat the innocent explorer or colonial administrator and his lady wife. These "natives" always move as an anonymous collective mass-in tribes or hordes. There is a great deal of overlap between the picture painted here and the dominant representations of the 'Arab' which El Asmar identified in a recent study of children's literature in Israel. According to this study, the 'Arabs', like the 'natives', are anonymous, moving in gangs and mobs. The 'Arabs' are dirty, they carry contagious diseases. They are thieves and untrustworthy. They are fighters, infiltrators, saboteurs. But contemporary Israeli representations of the 'Arab' do not only draw on classical colonial mythology. They are also bound up with certain selected representations of the 'other' of 'Jewish Tradition'. Like the 'special relationship' notion (see above), the way in which the 'Goyim' are different from the 'Jews' has been expressed in a wide range of conflicting forms, spiritual, genetic, cultural and so on. For example, some claim that 'the Jews' are different from 'the Goyim' by virtue of divine selection or genetic code, others that they have something to protect from them, such as 'Jewish Culture', or 'Jewish Tradition'. The latter corresponds to the threat of 'Assimilation'. Another threat which has been of central importance to the 'Jew'/'Goy' distinction, and the representation of the Goyim, is anti-Semitism. This is either an intrinsic characteristic of the Goy, or it arises out of the incompatibility of Goy and Jewish culture, or it is a result of the active stigmatisation of things Jewish by certain Goyim, in pursuit of their interests. The 'Arabs' are perceived as 'Goyim', and they are 'natives'. Thus they threaten the integrity, the purity, the sanctity and the order of the Jewish space. Filled with a hatred of Jews and things Jewish, they mean to invade, to penetrate, to kill, and to steal the land. At the same time, they are noble primitives and unfortunate victims of Fate or Chance. It is within this fragmented and contradictory field of images that discourses around Palestinian crime take place. ON 4 DECEMBER 1986, two young Palestinian students were shot dead by Israeli soldiers after a sit-down protest at a roadblock set up near Birzeit University in the West Bank. In the week that followed, several more violent confrontations took place between the military and Palestinian inhabitants, in the course of which two more Palestinians were killed and several wounded. During December, a large number of articles appeared in the Israeli press, reporting or reflecting on what had taken place. In those articles appearing in the Jerusalem Post, the following expressions were used to refer to the response of Palestinians allover the occupied territories to the first two shootings: 'wave of disturbances', 'unrest', 'wave of demonstrations', 'eruption', 'outbreaks', 'turmoil', 'disorder', 'riots', 'disturbances swept the West Bank', 'widespread disturbances continued to rock the Gaza Strip'. 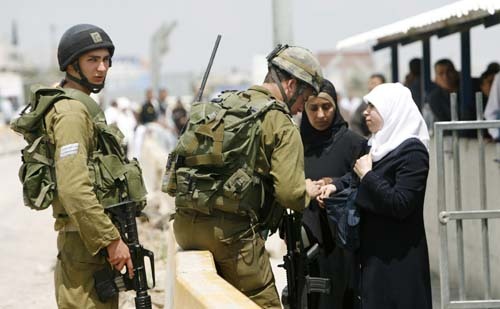 The actions of the IDF officers, however, were represented by the following expressions: 'self defence', 'preventing further violence', 'breaking up a demonstration', 'quelling the disturbances', 'maintaining law and order', 'troops used "maximal restraint" '. In addition, their actions were defended, or described as too lenient: 'the IDF has acted correctly in the circumstances, acted as it must act', 'the security forces had acted according to regulations', 'the security forces should show less "restraint" and... greater punishment of law-breakers should be imposed if order is to be maintained'. Explanations were offered or implied as follows: 'It's actually like a tetanus shot we have to administer every three months in order to keep things in check'; 'Israel's policy is to maintain law and order and peace for all the territories' inhabitants'; 'force will get the Arabs nowhere and will solve nothing'; 'life in the West Bank is returning to a semblance of normalcy'. Statements also pointed to the 'unusual' or 'exceptional' nature of the 'disturbances'. Thus: 'The wave of incidents is unusual but it is not a major outburst'; 'Israeli officials have characterised the worst unrest in the territories for years as an "unusual" development'; 'momentary ephemeral occurrences' . Israeli settlement was referred to both as the solution to, and the justification for, the confrontations: 'The disturbances should prompt the government to set up more settlements in the territories. Settlements are an assurance of security'. An IDF soldier who admitted to shooting one of the two Birzeit students argued, 'We were caught in an impossible situation. Had we retreated, no Israeli from the nearby settlements would be able to travel on the main road leading west'. It is easy to see how these expressions and assertions draw upon and reproduce the discourses on 'The Law' and 'Crime' which I identified above. They mobilise images of the 'restless native', the 'diseased Arab', the 'Order' of 'The Law'. The problem was basically one of an eruption of 'unrest' (by far and away the most common descriptive term used), a spurious outbreak of disorder. The solution is to 'quell' this outburst, to restore normality and order, to administer the medicine, and thus to put the troublemakers back to rest. Clearly settlement must go ahead-and so the criminals had to be dealt with. In fact, increased settlement would help prevent the same thing happening again. One slightly more critical position was also represented, which suggested that the IDF soldiers had acted a little harshly, and a less violent way must be found to solve the problem. ('Israel. . . must. . . reduce tensions in the sphere of settlement'.) But still the basic problem was the same. And on this occasion, disturbances had unfortunately broken out and had to be dealt with, a little less harshly if possible. Thus, even in this more critical formulation the basic issues were the same. Amongst all the articles, just one line of argument was offered which broke away from the dominant framework. This asserted that 'the disturbances are not marginal. They are politically very serious, grave and worrisome. Israel must not relate to them only militarily or in terms of maintaining law and order'. This certainly constitutes a move onto new ground. However the argument was preceded by the following: 'The disturbances were an attempt to block the political process leading towards peace.' Thus the politically serious nature of the disturbances, which were not simply breaches of the law by criminals, were aimed at blocking 'the political process leading towards peace'. Thus the 'politics' associated with the 'disturbances' is the 'worrisome' politics of 'saboteurs'. In such a context, this is hardly a very radical departure from the dominant defining frame. Here lies the importance of the media in enabling the state to define the situation; to set out the basic issues to be evaluated. The articles I surveyed contained a preponderance of direct quotes from Israeli government and army officials, regularly contacted by the press as spokespersons and experts. Thus it is through the institutional relationship between the state and the media that representatives of the state become what Stuart Hall calls 'primary definers' of the situation at hand. In the context of Palestinian crime, one extremely important defining representation is that of 'terrorism'. 'Terrorism' is the purest expression of Palestinian criminality, drawing on images of irrationality, of savagery and barbarism, anti-Semitism and Evil. In Israel, 'terrorism' is almost exclusively what Gilroy calls a 'racially distinct crime'. Israeli Police Minister Haim Bar-Lev refers to the need to deal with both 'Arab terrorism' and 'extremist reaction from Jews', since 'there is the same law for every resident in the country'. Thus, in the words of Noam Chomsky, 'Palestinians carry out terrorism, Israelis then retaliate, perhaps too harshly'. There have been numerous recorded incidents of Israeli settler attacks on Palestinian persons and property in the West Bank, often including the use of arms. According to an Israeli government report, whose publication was suppressed for two years, the perpetrators of these attacks 'are not perceived by the police as offenders in the usual sense'; their actions are 'not the usual criminal delinquency', since they are seen as 'springing from the desire to demonstrate 'rights' on the ground'. Thus' Jews' who attack' Arabs' are not criminals at all- they have simply 'taken the law into their own hands'. Palestinians, on the other hand, who are active in student or trade unions, or who write about 'Palestine' and the 'self-determination of the Palestinian people' are not simply lawbreakers, they are 'terrorists' too. What's more, 'terrorism' is a fact, a reality that cannot be explained; it is irrational, outside 'Jewish' understanding. Hence, 'Terror is a situation I have been living with since I arrived in this country.' And, 'There is no single way to end terror once and for all'. Similarly, 'Our policy was to fight terror with every legal means available'. Thus, through the media, the Israeli state is able to mobilise extremely powerful images, rooted in the dominant representations of the real experiences of (some) Israeli citizens, and articulated through the fragmentary traces of more developed 'traditional' ideologies of prior epochs, against those actions which conflict with its interests. What is important about these ways of understanding the world is not their direct correspondence to a 'reality' outside themselves, nor their logical consistency - indeed, they contain many inherent contradictions - but the connections that are made within them and their success as ways of 'making sense' of the problematic and contradictory nature of human experience. If they appeal, if they 'hail' the majority of the population into the community of group identity and group interest which they claim to represent, then they will often become the only available means of thinking about the problems which are posed. The collectivity or community is itself constructed and defined by the problems it is said to face, and by the 'other' which is the source of its problems. Thus it is the traditional discourses of 'Jewishness' and the 'native', re-expressed in terms of law and crime, national security and the public interest, which define the notion of 'Arab terrorism' for the community of 'civilised', 'law-abiding' Jewish citizens of Israel.